I always cringe when I think about the religion we have come to know—the careful, clean cut, compartmentalized corporation it has become. Whether Muslim or Buddhism and whether Christianity or Atheism, the world’s religions have created a chasm between humanity and the God of the universe. Religions have seemingly fashioned a protective orb that surrounds its members from those who aren’t like them. Religion has seemingly taken the place of God and have dictated what living a godly life means. The teachers of the Law in Jesus’ day were no different. Their interpretation of the original laws became a set of standards that one needed to live by in order to be counted worthy of God’s grace. They surrounded God’s laws with so many traditional laws that it became nearly impossible for someone to be counted as God’s children—unless, of course, you were one of the religious teachers or a follower of this hierarchal way. Don’t get me wrong. I love traditions. Traditions allow for a sense of connectedness to a particular people group and allow a pathway for rich history to take place within said group of people. Traditions allow generations to continue and thrive. Traditions allow for family holiday parties to continue over the years. Traditions, in the context of religion, allow for points of beginnings to be identified. And that’s a good thing. But when man allows traditions to become God’s laws and are used as a means to control others, then the grace of God becomes distorted. God, in light of man’s manipulated mandates, is shrunk down to humanity’s level and, at times, even lower. One of the first things that Jesus said when He stepped on the scene was, “I didn’t come to abolish the Law and the Prophets. I came to fulfill them (Matthew 5:17).” In other words, God stepped into human history and told these pre-first century religious folk that they got everything wrong. 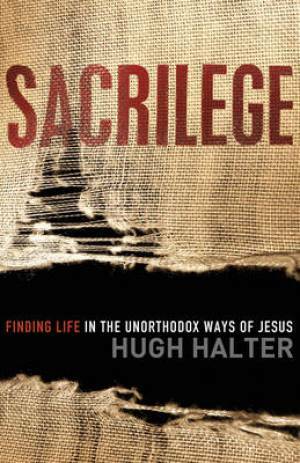 And, in Hugh Halter’s book, “Sacrilege,” that same spirit (of getting everything wrong in the Christian sense), flows throughout the folds of his writing. And this is the question a small group of “Christians” and I are also seeking to answer. What started out as a church’s young adults ministry has now become an intimate group of people exploring what it means to boldly and uncompromisingly follow Jesus. It, as one person retells the story of a night where she couldn’t go to sleep after reading the first chapter of the book, has become the springboard away from the prettiness of the religion and into the arms and lap of the God of the universe. Join me, over the next season, as I recount some of our conversations through this journey. Or, better yet, join us every Friday night at Portfolio Coffee House, in Long Beach, to explore what it means to stare religion in the face and choose to turn around and follow Jesus.